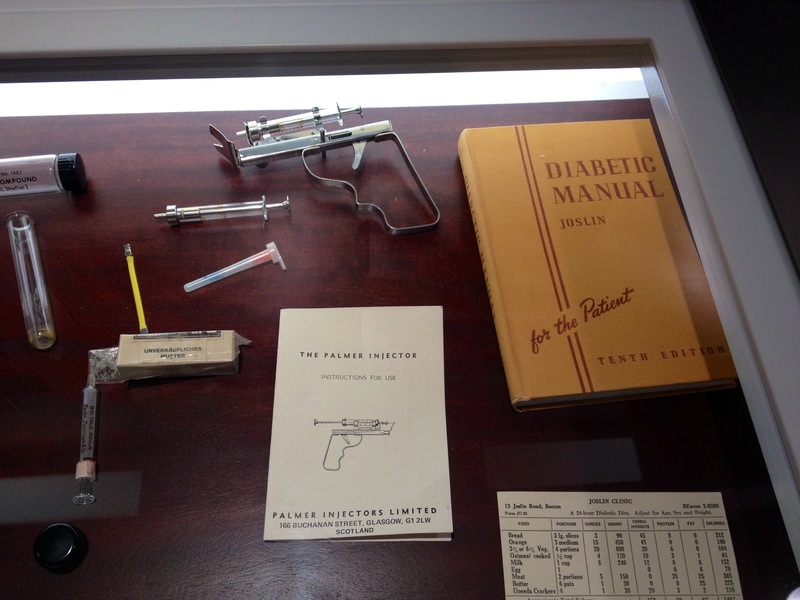 The Palmer Injector on display at the device museum at Medtronic Diabetes. Doubled as a torture instrument. There were, in my opinion, two distinct segments of the Medtronic/Bayer HealthCare Diabetes Advocates Forum: what we heard from Medtronic and what we heard from each other. Both deserve their own post for obvious reasons. We’ve come a long way in how insulin is delivered. As we snaked through the nifty device museum at Medtronic Diabetes, I was struck with how archaic devices that were supposed to help now just looked like medieval torture tools. It was an apt reminder as we talked with Medtronic Diabetes. You can read my disclosure at the bottom of this post regarding the compensation I received (or didn’t receive) from Medtronic and Bayer HealthCare for attending, but I should also give you another disclosure, which you may already know: I also currently wear a Medtronic MiniMed Paradigm Revel 723 insulin pump and have worn Medtronic devices since 2005 (both pumps and CGMs). I’ve got the curiosity of a cat and the mouth of a motor. I wanted to know what was going on with the latest iteration that’s made a huge wave in the diabetes community and I wanted to talk to Medtronic about my previous customer service experience with them. The agenda was given to us upon our arrival at a welcome dinner on Thursday and I was keen to see that our first morning would be spent hearing from Medtronic about the MiniMed 530G with Enlite (the latest iteration). It was as if they knew I wanted to interact straight out of the gate. They didn’t disappoint. Simple answer: No. The MiniMed 530G with Enlite was approved as a system: insulin pump, Enlite CGM sensors, and the Bayer Contour Next Link blood glucose monitor. I love my Medtronic MiniMed Revel insulin pump. It does what I want (although I readily admit that I need more training on the dual wave bolus feature), has most of the features that I want, and has been a work horse for me. I’ve looked at other insulin pump companies, but have the same thought over and over: “If you like your pump so much, why would you change?” Enter the CGM conundrum. I tried to use the Medtronic Sof-sensor. I really did. Here was my verdict: it hurt, the insertion process was daunting, and it wasn’t accurate for me. I shudder even know thinking about the actual insertion of the CGM sensor and the pain as it went in. I had a lot of sensor fails and my finger sticks never seemed to ever match the graphs on my pump. By the end of three days, if the CGM sensor made it that long, I was happy to take it off. As much as I love my MiniMed insulin pump, I wasn’t going to go through that again. 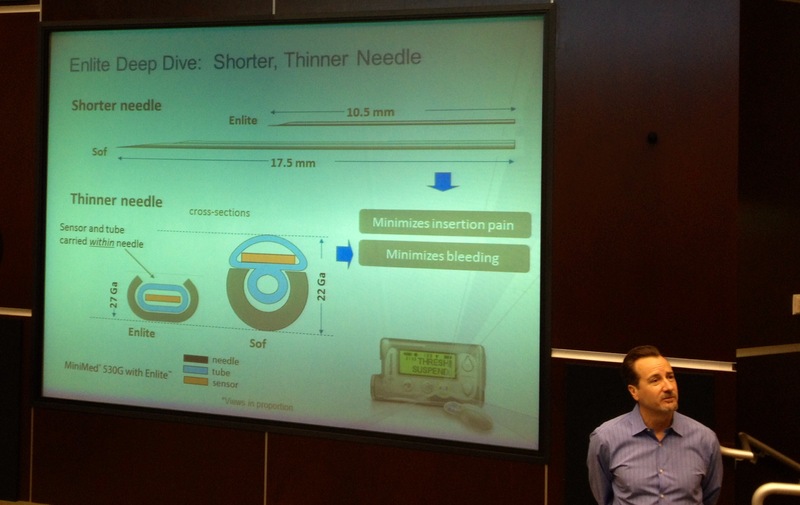 Cary Talbot of the Medtronic Diabetes CGM division showing the needle length and size difference between the Elite and the Sof-sensor CGM. According to Greg Meehan, Vice President and General Manager of the Continuous Glucose Monitoring business at Medtronic Diabetes, I won’t. He apologized to the group for the long wait for a better CGM sensor (10 years!) and for issues that had been identified (which is marketing speak for: we heard that it hurt and it wasn’t accurate and the insertion process was unnerving). A graphic comparison slide was thrown up during the presentation by Cary Talbot, showing the difference in insertion needle size length (38%) and gauge made my breath hitch. The new Enlite sensor is a world apart from the Sof-sensor. But it’s just a first step. There are a lot of steps before a true closed loop system happens, and Szyman explained that as it currently stands, people with diabetes will always have to make the decision to pre meal bolus with a Medtronic MiniMed system, much like most other existing “artificial pancreases” in human clinical trials. Medtronic also believes that glucagon shouldn’t be needed in a closed loop system with proper threshold settings and predictive analysis. During lunch on the second day, I had the pleasure of voicing my thoughts (along with a few other articulate advocates) about the term “artificial pancreas” and how Medtronic used it in their marketing. My belief is that while the FDA was very strict on how the entire system was labeled and no blame be placed, that better explanations could be given. (It’s tough to explain that I’m not cured when the average individual says: “So, when you get that artificial pancreas thingy, you won’t have diabetes anymore, right?” Um…. We live in a fast-paced world where most of what we talk about is shortened for our convenience sake: CGM, PWD, OMG… So when Medtronic says: “We called it Artificial Pancreas Technology”, my response was… no one hears the “Technology”. I’m curious to see if any changes are made in future marketing campaigns for the MiniMed 530G with Enlite. Medtronic Diabetes shared their new attitude about how they want users of their new MiniMed 530G with Enlite to be treated. They have an aggressive reach out program that spans the first six months of use, called the Start Right Program. Interesting concept, seeing as how my only interactions with Medtronic over the years has been a single visit from a Medtronic rep when I began using the Sof-sensor and then (I wish I was kidding) two calls from the regional sales rep to let me know my pump was almost out of warranty. I let Nancy Katz, Vice President of Consumer Marketing at Medtronic Diabetes know that I found my customer experience… lacking. She and I had a enlightening sidebar discussion about how they recognized the very issue I had and that they were taking steps to change it. The Start Right Program helps in three steps: motivating and preparing (the first time you get a pump can be scary just opening the box), encouraging good habits (set changes, uploading data), and navigating for success (identifying issues that may impede pump and CGM sensor usage). This is an outreach program that I hope will help those (like me) who had issues with CGM usage and stopped using the product in less than six months. Time will tell for those on the new 530G system with Enlite. I want every person with diabetes to have access to the tools and drugs that keep him or her healthy (and living). With the quickly changing medical insurance landscape that comes with the Affordable Care Act, Medicare/CMS, and private insurance, that’s not always possible. The Medtronic representatives (Chris Arapoff, US- Sr. Manager, Policy: Reimbursement and Health Economics at Medtronic Diabetes and Karen Blackwell, U.S. National Manager: Strategic Accounts at Medtronic Diabetes) spent the second morning sharing the reimbursement and coding hurdles that industry and government/private insurers grapple over. At this stage, Medicare/CMS will not cover CGM (continuous glucose monitoring) use, which precludes anyone on Medicare/CMS from using the new 530G with Enlite. They’re also finding issues with people “aging” into Medicare who previously had pumps and CGMs and are now having trouble with reimbursement. Diabetes is expensive on top of being time consuming and stress inducing. Medtronic does have financial assistance programs to work with those who need help, but you need to call and ask for it. The advocates asked for a way to make finding financial resource information simpler for this. We’ll see if this happens, but it would be great if it did. Chris Arapoff shared with us that he does work with other industry device manufacturers to help secure approval and reimbursement for CGM coverage, because a win for Medtronic is a win for everyone. (See It Ends With Us.) The hurdle is that currently, CGM usage is not shown to be essential for diabetes and “lacks a medical purpose.” Try telling that to anyone who suffers from hypoglycemic unawareness or has small children with diabetes. I look forward to seeing how advocates can help industry show the government that while diabetes devices may be expensive, it’s less than a hospital stay and long-term complications. Yeah, yeah. They’re a business. They make money. Living with diabetes is expensive. But what I saw was a willingness to admit that they’ve made mistakes in delaying certain things and not offering others and Medtronic Diabetes is doing something about it. I left the meeting still curious as a cat, but it’s now about what the future of Medtronic Diabetes holds for us. As far as my mouth being a motor, I hope that it can be used to spread news about that future. Thanks for this, Christel: One of the most telling comments I saw tweeted from the DOC group there, was a comment that I believe Mark O’Donnell made in regard to the marketing aspect of the 530G: “We missed the forest for the trees.” That admission was telling to me, because it wasn’t just a canned “Sure, we heard you and blah blah blah… the FDA used this whole big phrase and we were just following their path.” No, it showed an admission that they could have done better and recognize that. I really really really appreciate hearing that from MedT. And I really appreciated hearing all of that and this from you all who were there. What you’ve written here is insightful, and I appreciate it – can’t wait to read what’s next. Thanks for representing, with your curiosity and voice and relaying it to us through Twitter and your blog..
After this session, I’m really impressed with Medtronic. Yes, the 530G/Enlite availability announcement left me a bit disappointed at first. But from what I’ve seen, it really does seem that they are becoming PROACTIVE when it comes to listening to us, managing our expectations as well as working to delivering what we expect, engaging us as part of the process, and working behind-the-scenes to bring change to the various agencies that seemingly exist to prevent us from getting the very best technology to keep us healthy. (Holy run-on sentence, Batman!) How it all pans out remains to be seen, but I’m optimistic. Plus, when it comes to social-media PR, they are far better than the next three diabetes’ companies’ PR efforts. Combined. And I’m not just saying that because they bought me dinner. I’ve been using Medtronic for 17 years and over the past three years have had 6 pumps replaced due to “button errors.” I’ve also been using the Dexcom for several years and am completely in love with it. I tested the Medtronic 530G Enlite for one week against my Dexcom and it proved to be far less accurate (as other tests show). I wore the Animas and t:slim pumps as well and just don’t LOVE any of them. HELP – wish I could design my own pump! Have you looked at the Asante Snap? Melissa of http://www.sweetlyvoiced.com test drove one and loved it. She wrote a great review. I am currently using a Medtronic Paradigm 772 (Canada). I stopped using the sensors and transmitter several years ago because they were very uncomfortable and unreliable. No one seemed to recognize this at Medtronic Canada and I didn’t hear from anyone until the pump was at 5 years and eligible for replacement under a government program. I looked at all available pumps available in Canada earlier this year. Medronic, Animas, Omnipod, Accuchek. I was underwhelmed by the new Medtronic. Animas let me try the Dexcom standalone unit. I asked very pointedly if the Animas Vibe was fully compatible with Mac OS X. I was assured it was. Long story short it isn’t. (Mac OS X 10.9 Mavericks) The rep was great but she had misinformation. I revived my aging Medtronic 722 and am completely fed up. Would prefer to get a standalone Medtronic pump and the Dexcom standalone. No wonder I support “We want it now”. Please note I have been a T1 for 48 years. I think it’s a bit unfair to describe the Palmer Injector as a torture instrument. It was invented in 1955 and for 15 years was one of the better ways of self injecting especially for those with limited mobility. My grandfather, Charles Palmer invented it and manufactured it. They were all packed and sent from my family kitchen for nigh on15 years. I’ve used this gun myself on many occasions, and if held firmly against the skin, the device pinches it and then pulling the trigger fires the needle in painlessly. This was a huge advance on previous injection techniques. all profits were used to supply guns to those who couldn’t afford them.